I’m excited! I had a record month for running in April. My last record was 151 miles. April 2013 – 176 miles! Wow am I sore! Really though, I am excited to know that I can run that many miles in a month. That isn’t much for a lot of runners, but for me, it is amazing, especially since I have only been running only 13 months. Yesterday I had a goal to reach. My goal was to run 6 half mile intervals at a 7 minute pace. I have not done well with half mile repeats. They are hard and for some reason every day in the past month that I run them (usually Tuesday) it has been the hottest day of the week. Yesterday was no different, however it was cooler than last week. So I decide that in order to reach my goal, I would have to increase my recovery time between my intervals and slow down, even to a walk if needed to recover. I really want my body to get used to running that fast. It worked. I ran my intervals and jogged slowly and walked in between. I was able to get all 6 completed and averaged 7:00 overall. My total time for the full 7 mile run was just under 9 minutes, but that didn’t matter to me. With our 5K approaching in 18 days, I really wanted to get my speed down a bit and intervals are a great way to do that. Just a word of advice. If you run with an iPhone and don’t use iSmoothRun, you need to get it. It really is the best running app available. Not only does it keep up with your runs, shoes, miles, weather, etc., but it is invaluable doing interval runs! It tracks each interval and recovery between intervals. It even tells you audibly if you need to speed up, slow down or stay steady during the interval. No more looking at the phone or just hoping to get the right time. 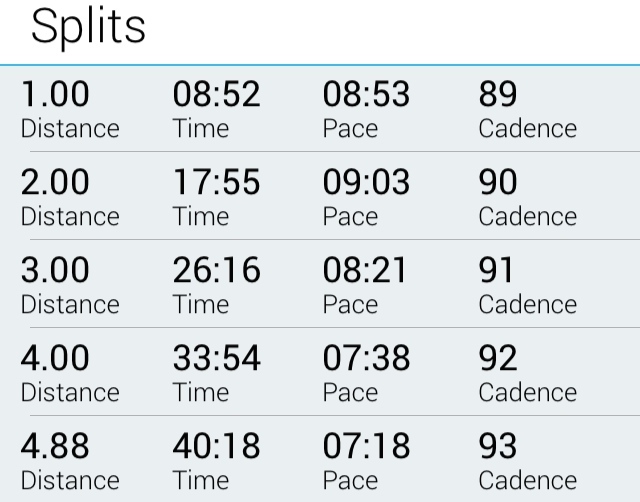 When you are done with each interval, it gives a recap of your time so you know how you did. Finally it doesn’t have a connected website, but lets you export to about 15 different sites (like Nike+ and Runkeeper) and to Twitter and Facebook. I wholly recommend it. So that was my day. I am sore today and my hip isn’t doing the best. I will do an easy run this afternoon in the rain. I am glad to get my speed workout behind me and move on with the week. I’m looking forward to our 5K. It should be a lot of fun and I have a lot of people from my work going to run it with TJ, RS and myself.